Microsoft Dynamics NAV is a flexible and feature-rich enterprise resource planning (ERP) system that efficiently consolidates a company’s processes and data into a single, intuitive software interface. Dynamics NAV comes with an impressive assortment of modules tailored for business manufacturing functions. Dynamics NAV brings disparate manufacturing processes together by giving users a rich set of production management tools. NAV enables users to integrate sales forecast projections with production scheduling, allowing for streamlined coordination between sales and manufacturing processes. NAV also combines made-to-order requests, make-or-buy decisions, order promising requests, bills of materials, and more into a single, accessible interface. Based on sales data entered into it, the Dynamics NAV system can automatically plan and create procurement orders; numerous variables, such as raw material inventory restrictions, factor into the system’s calculations. NAV can integrate warehouse management functionality into its core. Users can track and manage an array of warehouse processes such as: layout, space utilization, inventory, data collection, data entry, and more. 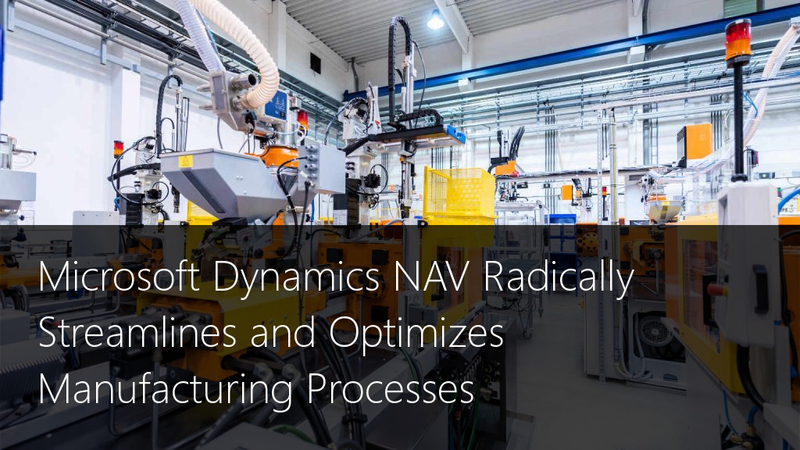 Dynamics NAV fully supports agile manufacturing methods, enabling users to quickly deal with last-minute changes, rush orders, and exceptions. The NAV suite offers several options that empower users to create and alter manufacturing processes in real-time. Users can set up work centers, set up and integrate production order routes, view and alter task lists, and more. Microsoft Dynamics NAV is a powerful enterprise resource planning suite that makes the conduct of business simpler and more efficient. If your company is in the market for a quality ERP solution, consider choosing a reliable software vendor that can help you smoothly integrate an ERP with your company’s operations.